If this is your first experience with Orthodox Christianity there are a few things you may like to know before you visit. Bibles are welcome, although you don’t need to bring your own. Almost everything we say and sing is directly or indirectly from the Holy Scriptures. Also, we have the Sunday Epistle and Gospel readings printed out in the bulletin. All of our services are in English. We do sing some things in other languages on occasion, but it is in addition to the English. Wear comfortable shoes! We stand a lot, but we’re used to it. If you need to sit, please sit! Children are very welcome to participate in worship as best as they are able. It is very important to us that children learn to be relaxed and comfortable in God’s House. Please bring your whole family! There is an area for nursing and diaper changing up in the Sunday School classroom which can be used during the services. If you need to take your children out of the sanctuary for a few moments feel free to do so. Kids are kids and our services can seem long to little ones. We are a diverse community and we don’t all dress or look alike. Most of our parishioners are converts to Orthodox Christianity but we have parish members with roots in the Middle East, Africa, and Eastern Europe. Some women cover their hair in accord with St Paul (1 Cor. 11:2-16) and some women don’t in order to emphasize the differen ce between traditional Middle Eastern Christianity and Islam. In our Archdiocese the only men who wear hats in church are bishops and monks so none of the men or boys will be wearing headwear. Some of us dress very formally but most of us fit the Southern ‘dress casual’ style. There is no firm ‘right’ and ‘wrong’ way to dress for worship but it’s always a good idea to maintain at least the same standard of formality as you would for work or school. We sing a lot. Almost the entire service is sung except for the sermon, the Lord’s Prayer, and the Creed. The choir and chanters lead the singing, but you are very welcome to join in. You can follow the service book. Copies are available in the narthex (entrance hall by the candles). We worship with our whole beings and not just with our spirits and minds. You will see people bowing, making the sign of the Cross, and lifting their hands in prayer. Although we rarely kneel on the Lord’s Day or the Sabbath, if you come to mid-week services you may see us kneel especially during fasting periods. You are most welcome to worship the Holy Trinity with your bodies according to our customs but no one will be offended if you are not comfortable doing so. 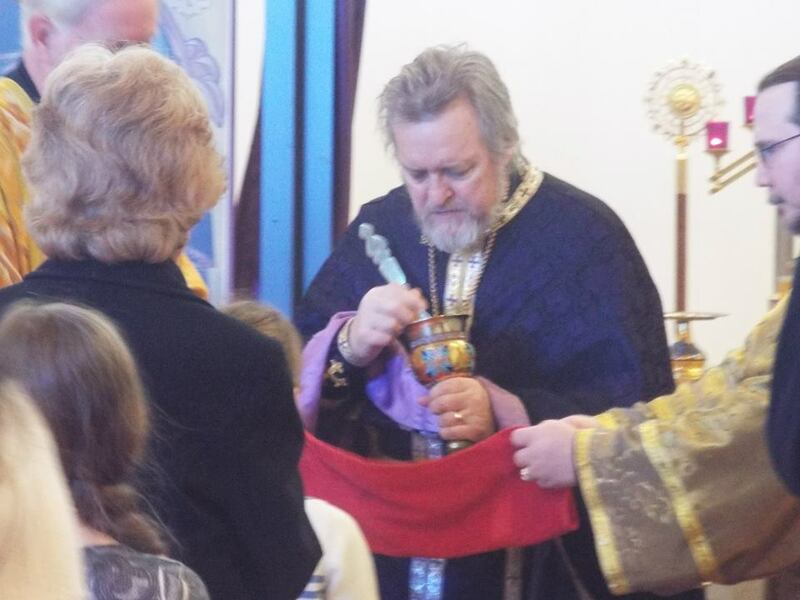 Only Orthodox Christians in good standing can receive Holy Communion, however, you are most welcome to partake of the blessed bread that is shared during communion and at the end of the service. This bread is from the same loaf as the bread that was used for Holy Communion. Someone may bring you some blessed bread as they return from receiving Communion. After the service you are welcome to venerate the Cross and take some more blessed bread. It is our custom to kiss the Cross as it is the symbol of Our Lord’s saving sacrifice. It is also our custom to kiss the priest’s hand as a sign of loving respect. If you feel comfortable you may follow our customs but no one is obliged to do so. If you do not want to kiss the Cross please come up anyway so that Fr. John has a chance to meet you. Please join us for refreshments and fellowship after the Sunday Services. We look forward to meeting you! 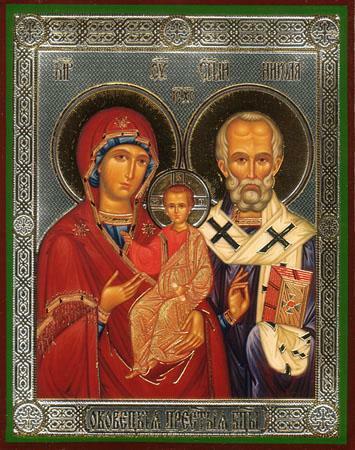 If you have any questions please ask and if you would like a tour of the church building and an explanation of the icons someone will be happy to arrange it. Please sign our guest book and sign up for our Email Newsletter. Like and Follow us on FaceBook for updates on events and great articles about Orthodoxy.